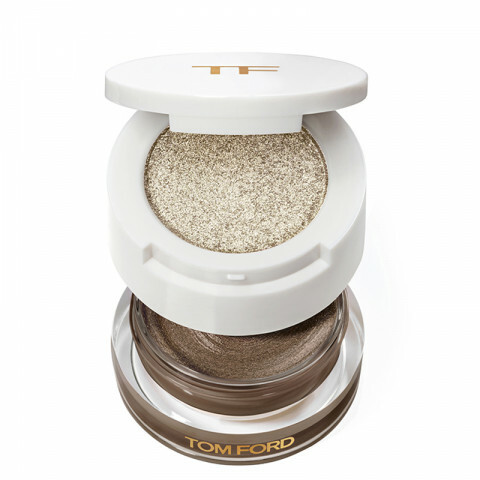 Tom Ford cream and powder combo in Golden Peach is absoutely stunning on! It has to be one of my absolute favorite shadows in my makeup cabinet. It offers buildable color and is just gorgeous on! I like to pair it with TF Metallic Mink liner. Out the door eye look in less than a minute. Wish there were more colors. Naked bronze is my favorite! It truly makes my blue-green eyes pop. Love it! It's perfect for someone like me, who likes to simplify the makeup routine yet still wants a stunning look. It's glittery yet natural, and a little goes a long way. It's easy to apply with fingertips. Definitely worth the money and a must-have! really nice texture and pigmentation to these eyeshadow duos. love the packaging which makes it easy to bring when traveling. never creases and feels comfortable on the eyes. young adonis is a beautiful silver/lilac color. Lovely cream shadows! The best on the market. I love how they pair with a glittery shade also. It brings an extra level of complexity to the look and it looks like you spent a lot of time on your eyes. Only takes about 5-10 sec to apply. I have Golden Peach and Naked Bronze. I recommend using your fingers on the glitter shade because it applies the best that way with the best pigmentation. Highly pigmented and it makes my eyes looks stunning! Love the texture of the product and the pigmentation. Use this all the time and it never creases. Good texture and color. Personally, I love Golden peach better than Paradiso.